These words app eared in an advert aired in October 2016. They caught the attention of many students who have studied through the National Student Financial Aid Scheme (NSFAS). This impassioned plea to recipients to repay their loans comes to us through a letter written by a six-year-old boy. He is crippled by the reality that, due to a lack of funds, his sister may not be able to gain access to higher education. Emotional blackmail. A shot from the NSFAS advert in which a six-year old boy writes to beg NSFAS loan recipients to repay their loans so his sister can attend a tertiary institution. The imagery invoked here is a powerful one. Very few people would not be touched by the image of a young woman distraught about her curtailed aspirations as her sibling pleads with those who were previously caught in a similar positon to rescue his sister’s dreams. Released to coincide with the ongoing crisis and protests at universities, this advert reveals important details about where government locates the crisis plaguing the higher education system. 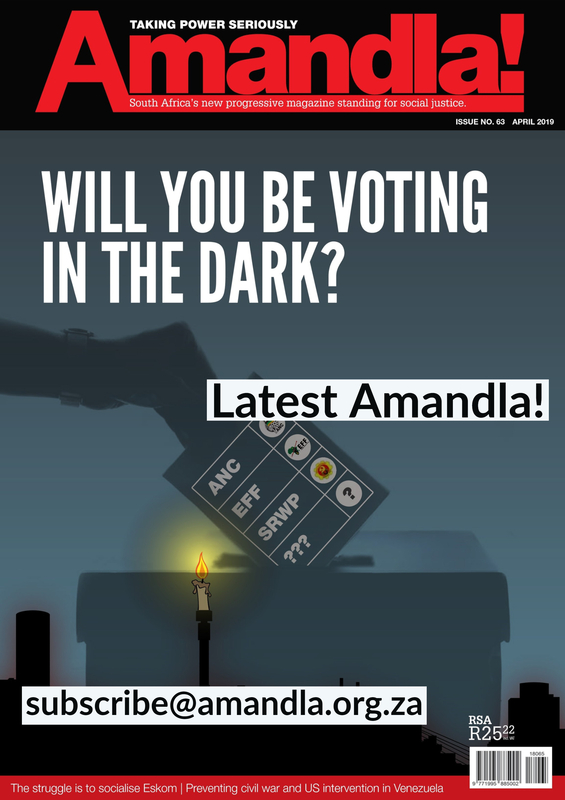 Along with emails, text messages and the pursuit of the scheme’s recipients by SARS, the advert is part of the agency’s strategy to recoup billions in unpaid student loans. To be sure, there is much to applaud about the re-engineering of the scheme following the findings and recommendations of the NSFAS Review Committee (2010). Included among these improvements is the increased visibility, interaction with the public and better synchronisation and uniformity of the system’s application across campuses. As children of domestic workers, street hawkers, mine workers, low paid administrators in private companies, security guards, the widowed, illiterate and unemployed, very few of us can deny the tangible gains that the scheme introduced to our lives. We became first generation graduates. With the foundation provided by the scheme, we proceeded to study further and chart career paths that were simply out of reach for the majority of black people, including our parents. There is a lot to be said about how the agency has been transformed from an invisible arm to an accessible machinery. But beneath these br illiant marketing and communication tactics lies a problematic framing of the poor as underserving, ungrateful and self‑destructive. The advert projects the scheme’s recipients as selfish saboteurs. It rests on the idea that a higher education is a oneway ticket out of poverty and want. The juxtaposition of a cash-strapped financial aid scheme with the lavish lifestyle of the post-apartheid young black middle class is geared at driving this point home. This stigmatisation tells us nothing about the struggles that students face during their time at university. The high drop-out rates amongst poor and mostly black students – a factor attributed to inadequate academic and financial support – is completely absent from this account. The narrative also conceals important details about the life experiences and prospects of poor students upon completion. It tells us little about the tenuous position of black doctors who were already drowning in debt amounting to hundreds of thousands of rands before they could even walk out of medical school. The scheme expects repayments from people earning as little as R30,000 per annum (R2,500 per month). It is indifferent to the experiences of young people in precarious forms of employment whose salaries are devoured by the high cost of food and transportation. It ignores the hard choices that young men and women make, between repaying this debt and extending an RDP house. Or building a house in order to rescue their siblings from sleeping on the kitchen floor, bathing in a bucket and studying on their laps. All of this escapes the imagination of those who only see a group of “entitled” people who are fleecing the public purse without conscience. 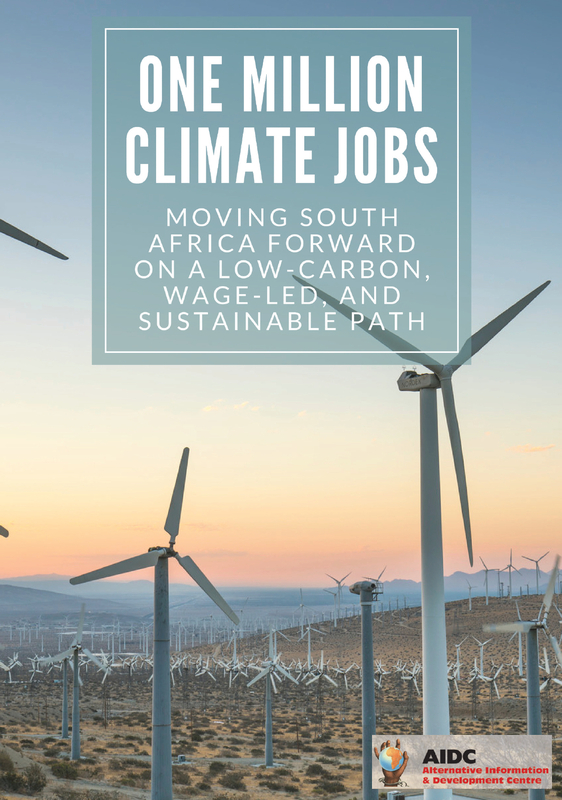 It tells us little about the salaries that subsidise families that are reeling under the pressures of a deindustrialising and highly financialised economy. The story is incomplete at best, inaccurate at worst. Feminist activist work offers some important insights into how the framing of the poor in policy discourse is always ideological. The word “dependency” is invoked when referring to recipients of social grants or welfare. It expresses how we explain the root causes of structural problems, stigmatise the poor and draw conclusions about their ability (or lack thereof) to escape their own shortcomings. According to this way of thinking, social problems are individualised and structural problems are explained away by casting doubt on the moral and psychological aptitudes of the individuals in question. In this way, the term “welfare mother” becomes closely associated with young, black women – irresponsible single mothers with a pathological sexuality. In our context, and despite evidence to the contrary, poor mothers who receive child support grants are stereotyped as consumerist and parasitic young women who use child rearing as a ticket for indulgence. The message communicated in this advert is typical of how the state delegitimises the poor’s claims to education and other social services. It is designed to paralyse and demobilise recipients of the loan scheme with guilt and shame. The struggle for “free education” is a struggle that strikes a sensitive cord with many people. But from this perspective the only contribution that former students can make is to fulfil their debt obligations. This “check yourself” attitude demonises potential allies in the struggle for free education. It limits our imagination about the different ways in which university graduates can utilise skills and knowledge acquired to make lasting contributions in our society. If anything, NSFAS’ overzealous debt recovery strategy is a classic case of buck passing. The total budget for student financial aid has not been able to keep up with the increasing numbers of students entering the university system. A commission tasked with reviewing the scheme underlined chronic underfunding as a major hurdle to the objectives of the scheme. 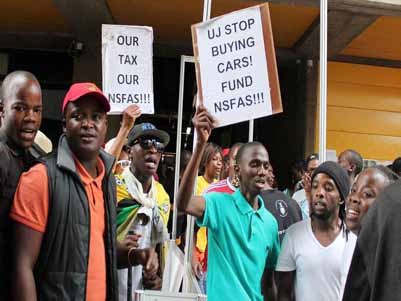 Students at the University of Johannesburg protesting at the underfunding of NSFAS. Even more important perhaps is the way in which this overzealous debt recovery is buttressed by a misguided belief. It is the belief that the poor must shoulder some costs of their education because education secures individual success, higher wages and better life chances. This is a direct challenge to the idea of education as a public good. It is quite revealing that government has made little headway in implementing those recommendations of the NSFAS Review Report that carry promise for free education. These include full, nonrepayable subsidies for the poor (however poverty is defined) and loans for children of lower middle income families, depending on their income. To this day, the NSFAS means test is integral to how the scheme functions. It still subjects poor students to a requirement to exhibit their poverty and parade their economic circumstances. Honest students who are thirsty for education are turned into liars who are compelled to manufacture stories about family incomes and chronic poverty in order to qualify for the scheme. In the final analysis, the advert sends a strong message about the state’s tacit opposition to the idea of free education. It shows how the state intends to scapegoat previous generations of poor students as if they are responsible for the current challenges facing the higher education system. Challenging the story told by the NSFAS public relations campaign is at the heart of rejecting the stigmatisation of the poor as underserving. It attacks the idea that the bill for education should be levied from individuals. It gives credence to the call for a free public education. Phindile Kunene is a former student activist and an educator at the Tshisimani Centre for Activist Education. if your parents are domestic workers and you`re passionate about studying how would you fill-up a consent form?